Apparently, I will invite myself to your house on the 4th of July, if you have a fantastic view of the fireworks. We’d been invited to a number of 4th of July events this year—okay, that made us sound douchey and much more popular than we really are. It may have been a coincidence, but I do give good potluck. The Macy’s fireworks were being moved back to the East River for the first time in many years [insert round of applause]. New Yorkers no longer had to share our fireworks display with New Jersey. Once again, I’d be able to watch the fireworks from my own neighborhood, as it should be. Their theme was ’MERICA Baby!, and I jumped on it by making a red, white and blue watermelon salad. I realize that my stars were six-pointed Jewish stars, but since it was a New York party it seemed kind of appropriate. The fireworks were stunning. The salad was a hit, bringing a nice level of ooh’s and aaah’s to delight the other guests at the party. I dressed it with my homemade elderflower champagne vinaigrette, but that will not be easy to find or make unless you have a couple of years. I whipped up this red white and blue salad featuring watermelon, jicama, and blueberries for a friends Fourth of July party. If you use a different cookie-cutter for the watermelon and jicama you can pretty much change the theme to create a patriotic salad for any summer occasion. I can see baby shapes for a baby shower salad, cars and trucks for a boy’s birthday, flower shapes for a garden party, etc. It could be fun to cut out initials. 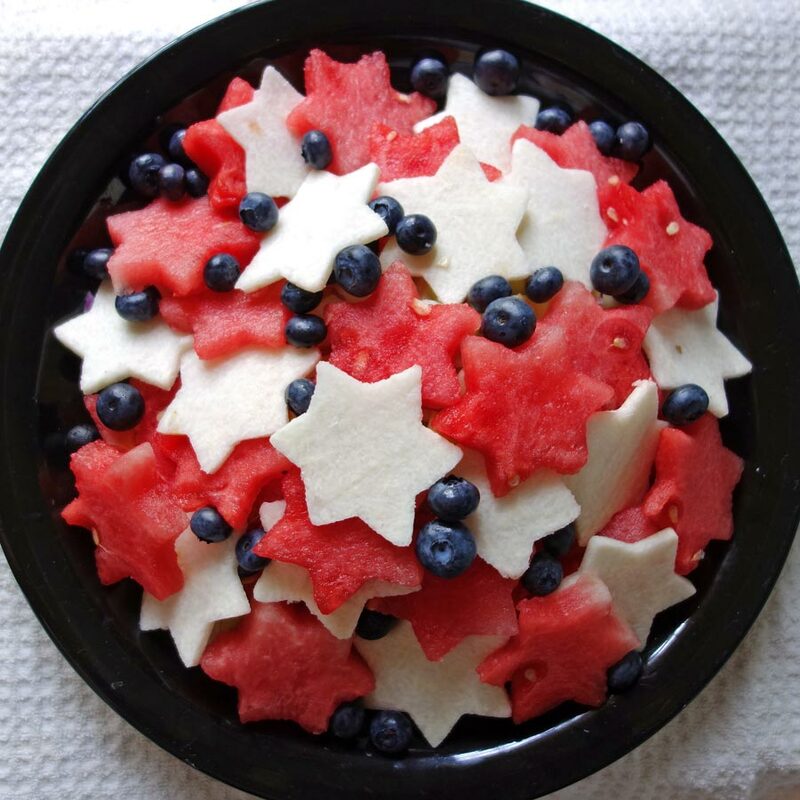 Cut watermelon and jicama into 1/4” slices and cut into stars or use your favorite cookie cutters. Set them aside. Cut the scraps of watermelon left over from the cookie cutting into small chunks. Slice the jicama scraps into strands. Mix the scraps of watermelon, jicama and half the blueberries with the red onions and mint or basil. Put mixture in a bowl, making sure to pile it high in the center for dramatic effect. Mix the lemon juice, olive oil, toss in the salad with half the pumpkin seeds. Add salt and pepper to taste. Sprinkle the salad with the pumpkin seeds. Starting at the bottom and arranging in contrasting colors, place the watermelon and jicama shapes on top of the salad. Sprinkle with remaining blueberries. Assemble this salad close to serving time because the salt will cause the watermelon to release it’s juices and water down the dressing.